VEIL of ISIS initiation helps to manifest higher thoughts into physical reality. The Initiation into the VEIL of ISIS comes in as Gold, Gold then pours through the other 24 initiations which come in on Silver Energy. VEIL of ISIS and the Gold helps in meditation and Shamanic Journeywork. There are many types of Gold, the Gold within the VEIL of ISIS initiation connects the intuitive mind with the heart. The VEIL of ISIS brings other benefits and helps to manifest positive results during and after meditation and Shamanic Journeywork. Pre-requisite to recieving these Initiation is Cosmic-Gold Tera-Mai Reiki One (Cosmic Gold - Tera Mai Reiki ). This is because the Journey with the Egyptian Archetypes is smoother when you have the support of natural healing energies. It may be possible to attend both courses either parallel or within a short space of each other. 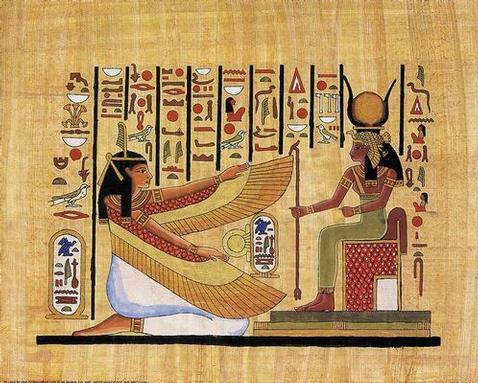 The Veil of Isis is the Crowning initiation into Egyptian Archetypal Energies, Isis represents virtues of nurturing and the power of love, compassion, forgiveness, mercy and Divine and Earthly magic and healing. YOD - first attunement, which opens the initiate to inner knowing. However, higher information is subtle and the initiate must also have a 'quiet mind'. Christopher gives this initiation in his Tera-Mai Reiki Mastership class, but it may be received separately. The remaining Egyptian Cartouche attunements connect the initiate to Archetypal Energies. The difference that the initiate feels after the attunements is that one is able to connect to archetypal energies beyond an intellectual conception, and use these energies in healing and (white) magic. Pyramid - initiation and protection, timeless growth and evolution. Enlightenment. Osiris - the loving father, teacher, consoler, the warrior who protects and bringer of justice, bring of the bounty of the harvest, Osiris can help us to re-member our true selves. Isis - the loving, nurturing mother. Magic and healing. Thoth - lord or karma, lord of time, healer and magician. Earth medicine and scholarly pursuits. Enables access to the Akashic Records. Nephthys - hidden knowledge, mysteries and secrets, revealer of truth. Ptath - architect of the universe, master builder, patron of men, regeneration at a cellular level. 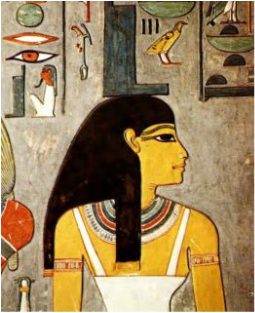 Hathor - patron of women. Beauty and harmony; order and balance. 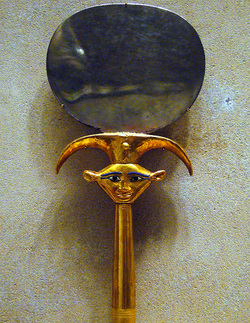 Her mirror is protective and connected to the earth element. Metaphysical abilities. Horus - healing of the physical eyes as well as the third eye. Healing of family members and family issues, artistry and creativity, protection and divination. Bast - joy, music, psychic abilities and intuition. Clearing, healing and protection of the mental body and brain. Anubis - protection and guidance, Anubis guides the recently departed safely to the Next World. Earth - connection to the earth elementals and the energies of grounding, foundation, abundance, prosperity, introspection and prayer. Air - connection to the air elementals and the energies of wisdom, knowledge, active intelligence and joy - being in the flow. Water - connection to the water elementals and the energies of intuition, healing, beauty and love. Sirius - connection to the star people and the Pure White Light of the Stars. When Atlantis broke up their arcane wisdom was broken up, Sirius helps to connect with this ancient knowledge and power. Uraeus - power of the Universe, which includes justice and mercy, abundance and prosperity; and energies of repair, rebuilding and re-generation, for those who are ready the Kundalini will rise. Ankh - the key to open doors of opportunity, love, joy etc. It is an energizer for other Egyptian symbols. The Masculine Feminine Balance. Buckle of Isis - fertility in ones endeavors, growth from transformation. Sphinx - keeper of the secret of animal power medicine. Keeper of Earth's secrets, magic, healing power, wonders and mysteries. Twins - connection to the twin flame, our guardian angel, who watches out for us from the world of spirit. It is our twin flame, who holds the other 2/3 masculine (or feminine) and 1/3 feminine (or masculine) balance of who we are. There are also properties which become more apparent as you work with the Twins. Crook & Flail - taking back our own authority. Helps to connect with the path that was chosen before birth. Scarab - the kind of transformation that comes when we release the old so that something better is able to come in. Lotus - peace of mind. Wisdom. Harmony. Balance. Winged Disk - Clarity. Clear communication. Success, fulfillment, opportunities, abundance and prosperity. Copyright © teramai-in-hampshire.com 2010-2016. All rights reserved.